I cannot recall much of the second half, and its probably for the best. So kindly excuse my lack of analysis of the specific moments and movements on the field which led to the defeat which by some quarters is still being referred to as a total capitulation. I am not of this opinion. I remain proud of the side and whilst it is tinged with bother of what could have been, our progress as a club remains superb. It is impossible for me to avoid mentioning the horror which occurred in London the same night, for despite my long term absence from my own flock, having spent much of the night here in Melbourne engaged in conversation via skype with my brethren from the motherland, I felt the carnage more keenly than similar incidents in recent memory. It put much in perspective. As my steadfast, probably unhealthy zeal in delving deep into global affairs often does. It encourages me to express myself, to seek the meaningful, the decent, the colourful and to try make the most of every wakeful second. In short, there are far more important matters we face as humanity than men kicking a ball around a park. Still, rather than focus on the insanity, I will continue this unexpectedly sombre – for many reasons – overview of the game. I had explained to a chum at work on Thursday my hesitation regarding the possibility of 1-2 players of our first XI failing to show, and what that could mean when facing a side able to call upon a far stronger squad already well accustomed to winning at the top level in the current era. I questioned whether we would be able to maintain the consistent brilliance as gloriously as our luck could hold, for we have required both to reach the final. Some say that Barca are a spent force, an echo of their former greatness. I disagree. We could well have lost the second leg by several goals, on the balance of decent chances created. Yet they were missed, thankfully. Our determination and cohesive belief was in full flow for the opening 45 minutes. It was a truly marvellous performance and a delight to watch. Yet something changed soon after the break. Perhaps it was the bother Pjanic received to his knee? This would certainly have played some part in our sudden inability to play the ball intelligently out of defence We had nowhere to go, it appeared, and were gifting possession to the opponents repeatedly. Even before the second goal flew in, unfortunate as the deflection certainly was, it had been coming. The flood gates opened and we simply could not recover. Madrid were worthy winners. They made their own luck. Pjanic and Khedira were both listless from what I recall in fragments from that terrible time. Alves unable to find traction anywhere on the flank. Dybala fully shackled by that cunning swine Ramos and with nobody in black and white able to put their foot on the ball and dictate any of the play we were done for. The only semblance of hope on the bench was Il Principino, hardly a game changer, who we have missed more than many realise. In hindsight, that is the only change that could have been made sooner, or even from the start. We missed his intelligence and experience. Most of all, when the going got tough. He still has a huge amount to offer and I would like to assume that he will be reintegrated into the first XI after a solid pre-season. As was the problem earlier the campaign, our unorthodox , sometimes awkward midfield came back to haunt us. And this is where I believe the battle was lost. Pjanic has been morphed into a deep lying playmaker, where he can excel though requires an awful lot of protection against the very best, in terms of having a true anchor man by his side who can read the play superbly and screen the defence. This is not Claudio’s natural game, but he has become damn good in the role over the years. The obvious solution to the problem is to bring in some fresh hustle and bustle aligned with great promise and to bed in a true DM. We have been playing without one all season. And at times, it has showed. Sami lacks the pace and intelligence to perform the duties required at DM. His intelligence is mainly offensive. Miralem can read the play and produce mesmerising moments higher up the field, but he is very offensively minded. Having two players as the pivot, neither of whom is naturally defensive minded makes for some splendid attacking verve, yet leaves us prone to been sliced upon through the middle. Add in the absence of a RB, instead asking a 36 year old still classy CB to cover that area, again augments the weakness I am highlighting. We are strong at CB, LB/LWB, Deep Lying Playmaker and at CF and SS. Elsewhere there is room for improvement. Especially on the right. Where Alves has sparkled beautifully, brought us all so much joy, yet he is in the twilight of his career. Cuadrado is a player who has improved this calendar year, though his form of late has been yet again haphazard. He was appalling on the night, and it will come as no surprise to many to find me concluding that he lacks the mentality and talent of a champion. The Colombian has helped our cause on many occasions, but I would be fine to see him leave the club. Too one dimensional, and with Alves ageing, we need someone more potent and more importantly, of far greater mental fortitude. A one trick pony whose head drops all too easily leaves us weak on that flank, when his failings are carefully exploited. De Sciglio could prove a great option at RB, but what of higher up the field? If we are to continue with a wide midfielder we need to spend on some real quality for that role. On the opposite flank, Sandro is fine, still room to improve but he has enjoyed an outstanding season. Pjaca will not be back for a fair while hence our interest in Keita and Bernardeschi, both of which are also happy, perhaps more useful, through the middle, which could mean a quality back-up for Dybala. Which is needed. Of equal importance is to bring in a CF. 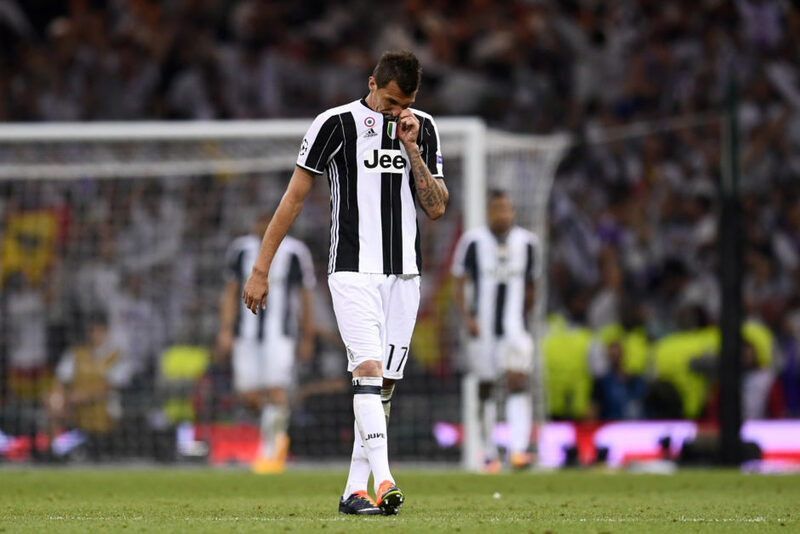 Higuain is a top striker, no doubt on that score whatsoever, but our only other option is Mandzukic, who has impressed in a LW/LM berth, but he remains shoe-horned. As his contract has been extended, we will see a lot more of the Croatian, and perhaps if a top drawer LW is recruited we might see the towering striker return to a more central position. If so, he will play second fiddle to the Argentine. Though will take some dislodging from his place in our 4-2-3-1. So drenched with russian fire water and Moet, weighed down by a heavy sense of deep dismay, I could have cried when I saw Lemina appear. A player who has no place in a champions league final of any era…Which I can now chuckle to recall. Yet this does illustrate the lack of strength in depth of the squad, which I have firm belief in Beppe and Fabio to continue improving, as they have done year upon year for many moons. Essentially, my opinion of our progress is unchanged. Winning is not all that matters, and though the performance in the second half was sickening to the soul, upon reflection, I remain very pleased indeed with achieving domestic doubles, the evolution of the side and reaching two champions league finals in three seasons. We are clearly heading in the right direction and this squad has not reached the end of an era, with no mass change required throughout the ranks. A beast as DM and we are instantly a stronger side. Add in some other talent in the areas I have discussed and still further we reach towards the ultimate goal. We are all hurting. Yet there will come a time when we will look back on this defeat and know it was merely a stepping stone – a rather hot one to our bare lower paws at that – towards glory.